Remember the last time you sat up on a wall with dangling feet? Until last Monday I don’t really recall the last time I did that myself. I usually don’t sit anywhere up high enough to have my feet dangling anyway. Most of the time my seem to be planted on the ground or on some kind of footrest or just anything solid. 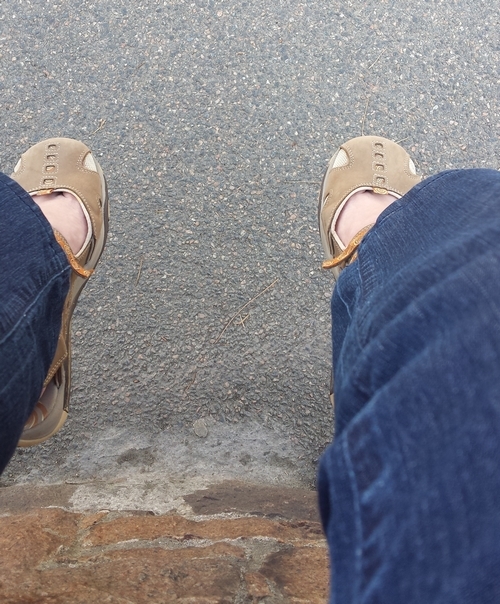 Last Monday though, during my wait for the bus outside Samares Manor on Jersey, I stopped leaning against the old stone wall and just pulled myself up and sat on it. And when you sit up on a wall, your feet dangling at least one feet above solid ground, you can’t help but swing your feet back and forth. And not doing much else. Which sometimes is the only thing you should be doing in that moment. I am very short, so my feet often dangle. I would say I have a dangling moment almost every day. And yes, it does make your feet swing! It reminds me of the scene in Dead Poet’s Society where he tells the boys to see the world from a different angle. I’m not too tall either, which was why I was surprised when I realized I didn’t remember the last time I did the dangling/swinging thing. What a great idea for a simple and retro pleasure!